A lot of information can be gained from heat exchanger brazing cycle temperature profile. It is probably one of the most important pieces of information that the brazing engineer can use to fully understand his process. A temperature profile will provide information such as heating rate, maximum peak brazing temperature, time at temperature, temperature uniformity across the heat exchanger and cooling rate. No other tool can provide so much information. The simplest method for obtaining a temperature profile is to attach thermocouple wires to various parts of the heat exchanger and graphing the resulting profile on a chart recorder. The disadvantage of this method is that the thermocouple wire must be long enough to traverse the length of the furnace. One must also ensure that the wire does not become entangled in the mesh belt. The second and more common (also more expensive) method of obtaining temperature profiles is with the use of a thermally insulated data pack. The data pack is a stand-alone unit capable of withstanding brazing temperatures. The thermocouples wired into the data pack are attached to various parts of the heat exchanger. The data pack then travels on the belt with the heat exchanger through the brazing furnace. At the end of the run, the data stored in the data pack is downloaded into a computer where graphs can be generated. The sophisticated software allows the user to determine quickly a number of parameters such as maximum temperature reached by each thermocouple. Recent advances in thermal profiling allows getting information in real time. The thermally insulated data pack transmits data in real time from inside the brazing furnace to a computer situated outside the furnace using the latest radio telemetry technology. Changes to the furnace settings can now be seen instantly1. A minimum average heating rate of 20°C/min up to the maximum brazing temperature is recommended. With very large heat exchangers such as charge air coolers, lower heating rates may be used, but with higher flux loadings. Once the flux starts to melt, it also begins to dry out. With slower heating rates, it is possible that the flux can be sufficiently dry as to loose its effectiveness when the filler metal starts to melt or before the maximum brazing temperature is reached. 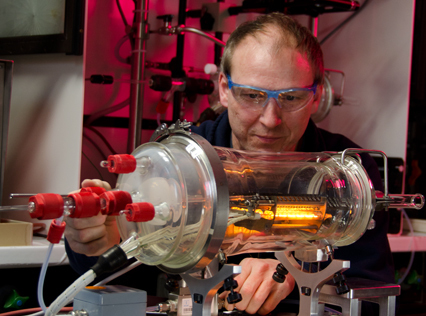 Heating rates up to 45°C/min in the range of 400°C to 600°C are not uncommon. One could say that the faster the heating the better. However, temperature uniformity across the heat exchanger must be maintained especially when approaching the maximum brazing temperature and this becomes increasingly more difficult with fast heating rates. For most alloy packages, the recommended maximum peak brazing temperature is anywhere from 595°C to 605°C and in most cases around 600°C. During heat up, there may be quite a variation in temperature across the heat exchanger. The variation will tighten as the maximum temperature is reached. 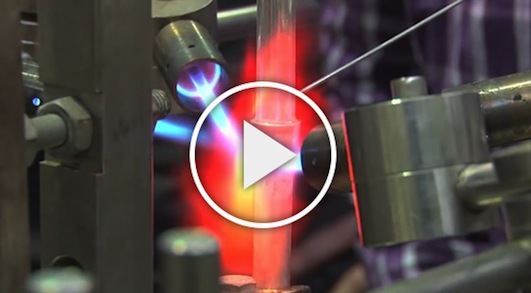 At brazing temperature it is recommended that the variation should not exceed ± 5°C. This can be difficult to maintain when larger units are processed which have differing mass areas within the product. The brazed product should not remain at the maximum brazing temperature for any longer than 3 to 5 minutes. The reason is that a phenomenon known as filler metal erosion (core alloy dissolution / Silicon penetration into the base material) begins to take place as soon as the filler metal becomes molten. And so the longer the filler metal remains molten, the more severe the erosion is. The graph below shows an actual temperature profile for a heat exchanger brazed in a tunnel furnace. One characteristic feature of all temperature profiles is where the curve flattens out when approaching the maximum peak brazing temperature (area shown in blue circle). The plateau in the temperature profile is associated with the start of melting of the filler metal at 577°C, known as the latent heat of fusion. It is called latent heat because there is no temperature change when going from solid to liquid, only a phase change. Temperature profile for a heat exchanger brazed in a tunnel furnace. The most common source of nitrogen is that generated from liquid nitrogen storage tanks. 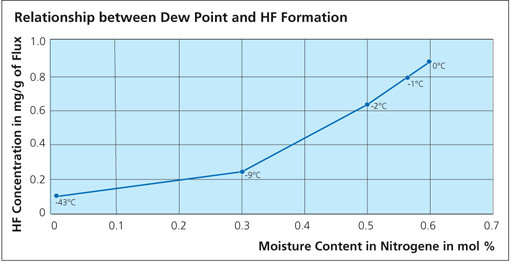 A typical nitrogen gas specification from a liquid source indicates that the moisture content is <1.5 ppm (dew point = -73°C) and an oxygen level of <3 ppm. In brazing furnaces however, the normal atmospheric operating conditions almost always exceed incoming nitrogen contaminant levels. This is due to water and oxygen dragged into the furnace by the incoming products, by the stainless steel mesh belt and by the potential back-streaming of factory atmosphere through the entrance and exit of the furnace. The latter will occur when the exhaust and incoming nitrogen are not properly balanced. Many furnaces are equipped with dew point and oxygen measurement devices. It is important that the measurements are taken in the critical brazing zone of the furnace because this is where these impurities will reach their lowest concentrations. Measuring dew point or oxygen levels anywhere else in the furnace may be of academic interest, but will not represent actual brazing conditions. Measuring the moisture content in the critical brazing zone of the furnace has always been a key indicator of the quality of the brazing atmosphere. Moisture can substantially influence the quality and appearance of the brazed heat exchanger as well as the first time through braze quality (% rejects). One of the more common principles of measuring dew point is using chilled mirror technology. 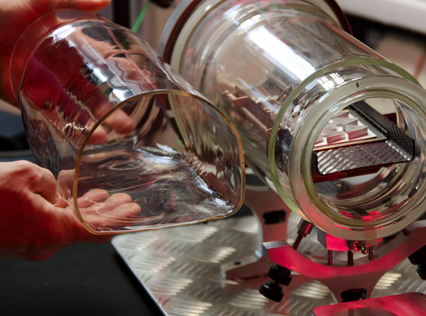 The measurement of the water vapor content of a gas by the dew point technique involves chilling a surface, usually a metallic mirror, to the temperature at which water on the mirror surface is in equilibrium with the water vapor pressure in the gas sample above the surface. At this temperature, the mass of water on the surface is neither increasing (too cold a surface) nor decreasing (too warm a surface). In the chilled-mirror technique, a mirror is constructed from a material with good thermal conductivity such as silver or copper, and properly plated with an inert metal such as iridium, rubidium, nickel, or gold to prevent tarnishing and oxidation. 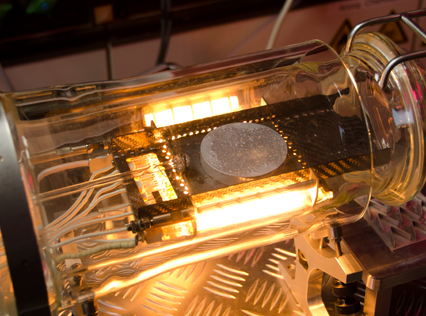 The mirror is chilled using a thermoelectric cooler until dew just begins to form. The temperature at which dew is formed on the mirror is displayed as the dew point. The advantage of the chilled mirror dew point meter is that it is an absolute measurement with high precision. However, this measurement technique is sensitive to pollutants and corrosive contaminants which, in the brazing process, include KAlF4 condensation and trace amounts of HF gas. Consequently, the mirror requires frequent maintenance and replacement. “Dirty” mirrors can lead to false readings. The principle of operation for measuring is that an electrolyte is formed by absorption of water on a highly hygroscopic surface (e.g. P2O5) and the current level obtained to electrolyze the surface is proportional to the water content. The advantage of this principle of operation is that it is insensitive to aggressive media. The disadvantage is that the precision is not as high as chilled mirror technology. Some heat exchanger manufacturers have reported good success using this measurement principle in their CAB furnaces. 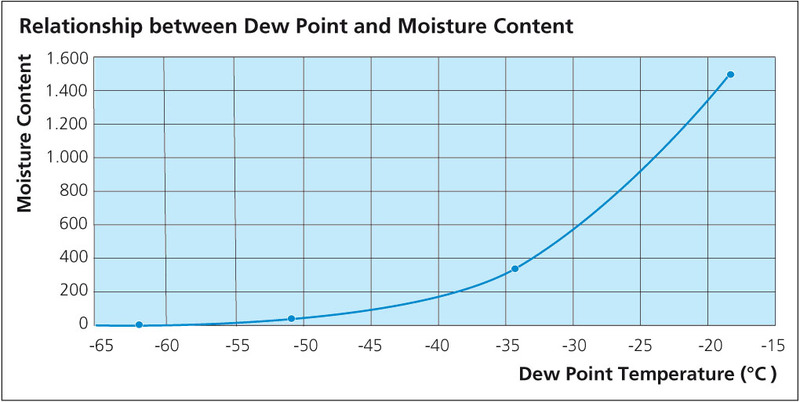 The relationship between dew point and moisture content is not linear. It is important to note that small changes in dew point will result in large changes in actual moisture content. This is evident from the graph shown below.